The city of Fayette joins with the County to support the Fayette County Senior Centers through the West Alabama Regional Commission on Aging. 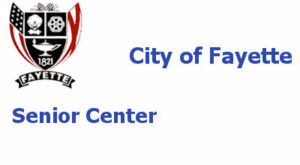 The Senior Centers in Fayette are located downtown and in the Mayfair Manor Activity Center. The Senior Centers provide hot nutritious meals, assistance programs, educational programs, activities and services, as well as some health screening services along with a chance to socialize with peers. Transportation is provided to the Center daily for a variety of activities and meal. Activities may include music, stationary bike, games, puzzles, special speakers, recreational and shopping trips. The Senior Center offers Home Delivered Meals that are specifically designed for home-bound persons in need of hot nutritious meals. Frozen meals are also available as are Homemaker Services to those that are home-bound.